Yenka PCBs is an add-on for Yenka Electronics. It takes the 2D circuits you simulate, and converts them automatically into three-dimensional PCB simulations, which can be exported for manufacture. This produces a full 3D simulation of the components on your circuit board. 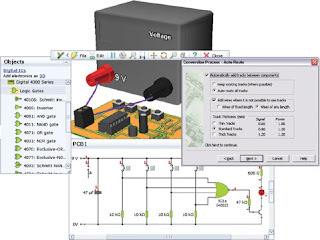 In this simulation, you can interact with switches or controls in either the 2D or 3D views; both views of your circuit are simulated concurrently.